I live on the east coast, but I have been to Silicon Valley twice; visiting Apple’s mothership was a must-do for me. Perhaps you feel the same way. It’s exciting for us fans, though all you can really do is park, take pictures out in front of the main 1 Infinite Loop building, and the Apple sign near the street, then visit The Company Store. It’s a special treat as they don’t sell Apple devices, they sell logoed items not found anywhere else. I don’t know if I would go so far as to call my visit a pilgrimage, but it was a top priority for me, if I was going to be anywhere near Silicon Valley. 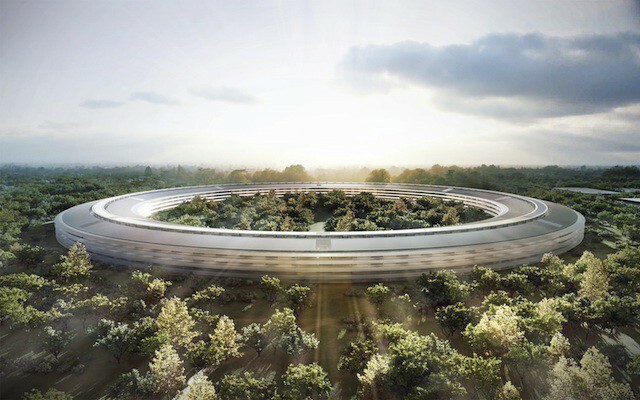 So now let’s ponder that new Apple campus that Steve Jobs announced to the Cupertino City Council in June of last year. It’s set to open sometime in 2015. It’s just beautiful and very unique, as Apple has reversed the typical ratio of 80% building to 20% landscaping to just 20% building and 80% landscaping! It definitely looks like a sort of flying saucer, or more accurately, a flying ring. I know I’ll want to visit this campus one day and I’m sure even more fans will also want to as well. Plus, architects, artists, students, tourists, and the just plain curious. The new campus will become a mainstream destination and Apple needs to realize this, and more importantly, embrace it. I have what I think is a great idea, and this article serves as a vehicle to plant the seed of this idea, hopefully even to Apple’s leadership team. First though, and in all frankness, a corporate museum is something that Steve Jobs himself had been against. He certainly would have continued to be so, if he was still living, but that’s another key consideration. Especially with Steve’s passing, this idea / project should be seriously considered by Apple’s leadership. Apple needs to build a public museum to celebrate it’s past and present. It also needs to create a dedicated public space at the new campus. A space where visitors can spend a couple of hours learning more about the company they respect, and about the past products and leadership which brought Apple to the here and now. A wonderful place for visitors to relax and learn about Apple’s exciting past, while standing in the exciting present, and future of the company. A place to also learn something more of Steve Jobs, and to further celebrate his life and influence on Apple, and the world. I do not suggest an archive though, as that already exists at Stanford University. Shortly after Steve Jobs returned to Apple, he canceled plans to create a corporate museum and gave Stanford all of the archives in 1997. Steve Jobs is Apple’s Walt Disney. There are many interesting comparisons and parallels to be made of the two men. There even became an interesting bond between the two companies, which is currently continued with Bob Igor, Disney’s CEO, who joined Apple’s board after Steve’s death. The Walt Disney Company stands as a good example in how to handle the legacy of a founder. Apple’s not all about Steve Jobs, but his legacy is the brightest star that still shines there. Apple must have a special section of the museum dedicated to him, and one that captures and displays his exceptional impact on life today through personal technology. There are plenty of books and documentaries about Steve Jobs, but his philosophy of design needs to be acknowledged and remembered further by Apple, at Apple. A museum space would become a special destination of the new corporate offices, for both the public and employees. If possible, an entire public area would make the most sense. This space would include it’s own public reception, lobby and lounge. Also, having the museum adjacent to the company store and adjacent to an area of the cafeteria would be ideal. This creates an entire public venue for visitors to have a relaxing and very enjoyable trip to the new Apple campus. It would all become a further part of branding and the Apple customer experience, for those who are. This idea presents some complicated and serious planning issues for Apple in regard to access, parking, management and security. It would absolutely be an additional and ongoing cost to them, but the PR value would be priceless. More people are going to want to visit this new campus, so why not better facilitate and mange it. Apple should own the experience and integrate it. 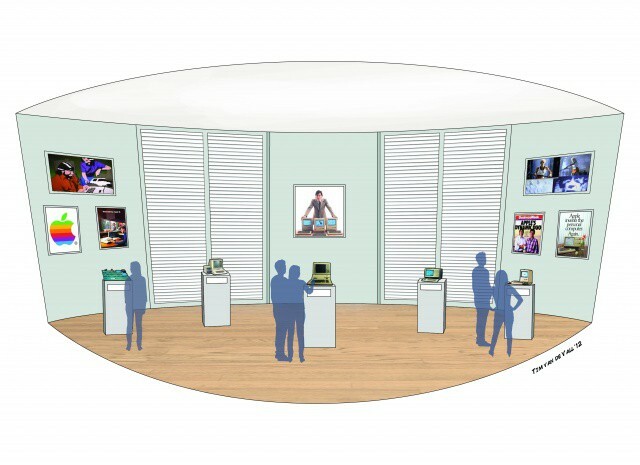 It’s important that the Apple corporate museum be balanced and fair in it’s reflections, both with the people that have lead Apple – Tim Cook, Steve Jobs, Gil Amelio, Michael Spindler, John Sculley, Mike Markkula and Michael Scott, and its products – iPad, iPhone, Macintosh, Newton, Lisa, Apple ///, Apple ][, etc. Much can be learned and reflected upon in this context. The 1985 – 1996 years especially serve to even greater bolster Steve Jobs’ renaissance years after returning to run Apple. The company now is an example of recovery and success through his vision. Here are two original pieces of art showing the first two areas of the museum. I would imagine the full museum to be about two or three times this in size. It would probably make sense to dedicate large spaces to the Apple ][ years, the Macintosh, and then the return of Steve Jobs and his revival of Apple. At or near the front of the new Apple Campus is the main entrance, with a large glass paned area. This is the public reception area and public spaces of the building. After entering, and to the left along the curve of the building is the entrance to both the corporate Apple Museum and corporate Apple Store. There are connectors between these two spaces, with both emptying out to the public cafeteria and lounge. An exit here takes visitors easily back to public parking, or they may go back through and back out the lobby. The lobby of both the museum and store contain a large picture of Steve Jobs and Steve Wozniak hung on the wall. There are smaller pictures too, showing images of early microcomputers and the Homebrew Computer Club. Out on the floor are the items which the two Steves sold to start Apple Computer. There is a glass case with an HP-35 calculator like what Woz owned, and a VW mini-bus like the one Jobs had. There is a stand with a plaque between them describing the humble beginnings of the two Steves, and the start of their company together. 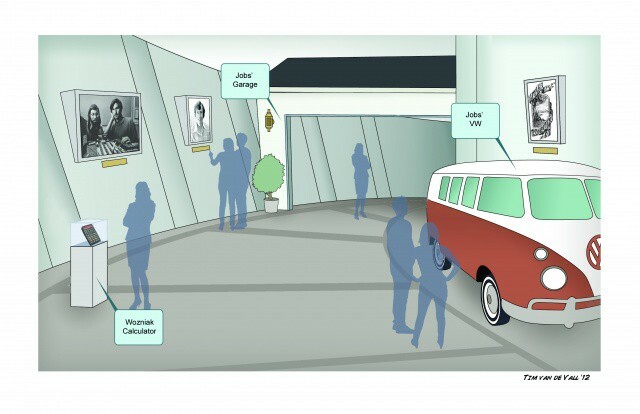 A reproduction of the fasade of the Jobs’ garage from 1976 is the entrance to the museum. A short glass wall extends from the right of the garage, so that closer to the entrance of this lobby is the entrance of the store off to the right. Upon entering the garage, the museum flows back along the curve of the building with two-story high ceilings. There is refracted light along the ceiling, in the original colors of the Apple logo. This light becomes a sliver-blue much further back. The outer wall is lined with rows of wall, then shutters, etc. The space has a very Apple Store like simplicity and grace, with white walls, light brown tables, wooden or marbled floors and accents. At the front of the museum entrance is a glass case with the Apple 1, the company’s first computer. Along the left (outer wall side) are stands with the Apple ][ computer, the Apple ///, the Apple Lisa and the original Macintosh. On the walls behind could be enlarged original advertising, colorful logo’d boxes, enlarged brochures, etc. More pictures of both Steve Wozniak and Steve Jobs are displayed. The famous “1984” Macintosh commercial is projected along one wall. Along the right-hand walls are photos of the different Apple founders, Presidents, CEOs and other key people. There are stands along here too, with models of Apple’s offices. Small buildings to the larger, former (current) main campus of Apple. Further back is a display to NeXT Computer and the change of Apple Computer, Inc. to just Apple, Inc. Perhaps there could even be an example of a Power Computing Mac clone (Apple purchased Power Computing in 1997) to acknowledge the short-lived Mac clones. I don’t need to tell you that Apple has transcended its place as a regular corporate enterprise. This museum and visitor’s center belongs at the new Apple campus. What a fantastic place it could be too, and what a wonderful gift Apple could give to its loyal customers and fans. Apple, your fans would want this, and they will love you even more. Please think about it. This is a guest post by David Greelish, a computer historian and president of the Atlanta Historical Computing Society. It was originally published here. Greelish is a lifelong fan of Apple. He has been one for most of his adulthood, going back to 1986. The Macintosh has been a core part of his life, and has played a critical role in his creativity, and in his professional and personal work. He is a computer historian, author and produces podcasts. His interest in general computer history arose from his interest in personal computer history, and that arose from his interest in Apple’s history. All of that was sparked by his interest in the history of his first real computer, the Apple Lisa.